First Solar offered a cautious outlook on sales this year, but said Thursday it cut manufacturing costs and promised a rapid expansion in utility-scale projects. The thin film giant reported second-quarter financial results with a 12 percent increase in sales. However, earnings were down, primarily due to lower module selling prices. The world's largest solar maker acknowledged replacing some modules made from June 2008 to June 2009 because of declines in power output. It said replacement costs would add up to slightly more than $23 million for an anticipated 30 megawatts of modules. Perhaps most significantly, the company cut its 2010 sales expectation to $2.5 billion to $2.6 billion from the $2.6 billion to $2.7 billion it forecast in April. *Module manufacturing costs fell to 76 cents a watt, down 5 cents from the first quarter. Annual throughput per line was up 6 percent to 59 megawatts and material costs were lower. The company's target is to reach 52 cents to 63 cents a watt in 2014. *Utility-scale projects are expected to increase. 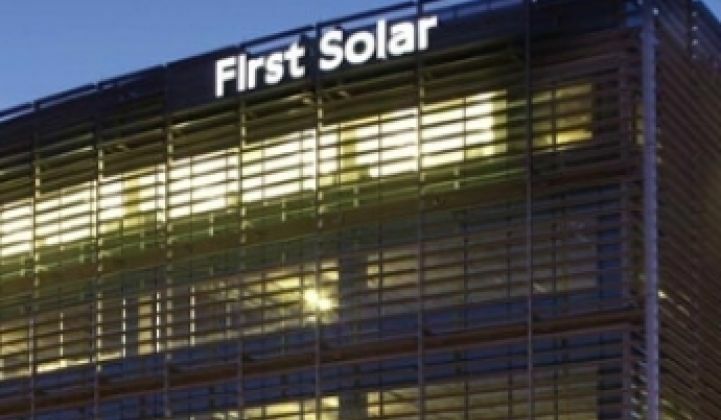 First Solar said it anticipates building 500 to 700 megawatts of projects in North America during 2011, up from 175 megawatts this year. *Demand is expected to exceed supply in 2010. First Solar expects production capacity to be 2.2 gigawatts by 2012, up from 1.4 gigawatts this year. Module conversion efficiency was 11.2 percent in the second quarter compared with 11.1 percent in the first quarter.